Since the limited amount of gas survived from the first bulk star forming process will be quickly expelled within several million years, star clusters have long been thought of as "infertile" stellar systems that cannot form new stars. Only collisions or mergers of stars can lead to rejuvenation of much older stars, making them look younger than most normal stars in much the same way as humans apply facelifts. Such stars are known as "blue stragglers," because they appear to "straggle" behind the natural evolution of most stars in a star cluster: They still resemble extremely hot (and therefore blue) young stars. Using the Hubble Space Telescope, an international research team led by Dr. DENG Licai from the National Astronomical Observatories of the Chinese Academy of Sciences (NAOC) detected an unexpected population of blue straggler stars in a young "globular" cluster, known by its catalogue number "NGC 2173." This is surprising, because blue straggler stars in this cluster seem to have formed in a well-defined burst. The team's findings were published in The Astrophysical Journal. "In principle, stellar collisions or binary mergers should not take place at the same time. They will happen randomly in star clusters and produce blue straggler stars that seem to have different ages," said Dr. LI Chengyuan of Australia's Macquarie University, the first author of this work. 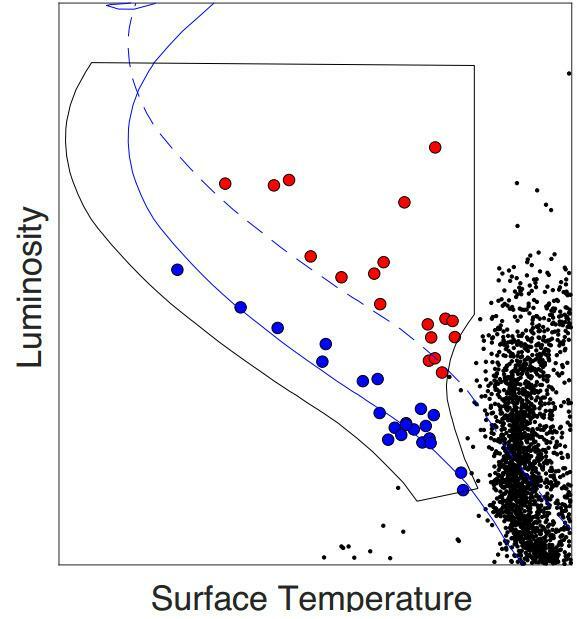 Astronomers study stellar ages using a common diagram that relates stellar brightness to temperature at the stellar surface. Blue straggler stars formed randomly would produce a smattering of stars across the diagram. If they were born at the same time, however, they would clearly show a tight sequence. In NGC 2173, Dr. DENG and his colleagues detected two distinct sequences of blue straggler stars in the diagnostic diagram. Although this is not the first time astronomers have detected such clearly distinct blue straggler sequences in star clusters, such features were previously only found in old "globular" clusters, with ages more than 10 billion years. This is the first time astronomers have found a similar pattern in a much younger cluster of only 1 to 2 billion years old. "When the very cores of clusters collapse under the gravity of all the stars in that small volume of space, we witness one of the most extreme astronomical events. When this happens, the cluster becomes extremely dense and you can imagine that many stellar collisions could happen in the core region. As a result, lots of blue straggler stars could be produced. For this reason, the double sequence of blue stragglers can be expected in clusters only when they get old, older than 10 billion years," said Dr. DENG. "However, we did not find any evidence that supports the presence of a collapsed core in this cluster. In addition, the conditions in this cluster even disfavor the occurrence of many stellar collisions," said Dr. LI. "This work certainly presents unexpected, and therefore interesting observational results," commented the anonymous reviewer solicited by the editors of The Astrophysical Journal. "It challenges the generality of explanations put forward for other such blue straggler sequences." "This is contradictory to our expectation. Star clusters and their populations seem to keep providing surprises every time we look just a litter closer," said Prof. Alison Sills from McMaster University in Canada in a News & Views commentary published in the prestigious professional journal Nature Astronomy. Astrophysics at Peking University, Yunnan Observatories of the Chinese Academy of Sciences, and the Department of Astronomy of China West Normal University.